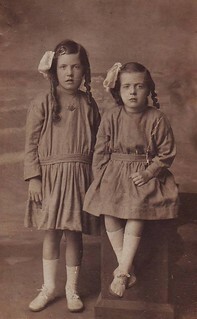 My great grandparents had two daughters, Isabella and Williamina. They thought my grandmother was going to be a boy and picked the name William. When she was born a girl, they stuck with the name anyway. Most people called her Mina. In the photo below, my grandmother is on the right and was 5 1/2 years old. 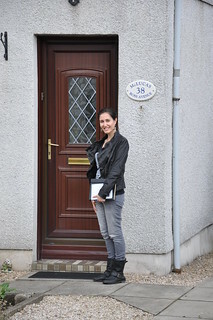 When she was born, the family lived in Bay St, Port Glasgow. The part of the street where their home was is gone now – demolished or destroyed in the Blitz, I don’t know. I found some pictures of Bay St from the 1920s when they would’ve lived there online. You can click the old images to go to the websites I found them from and see other images from the time. 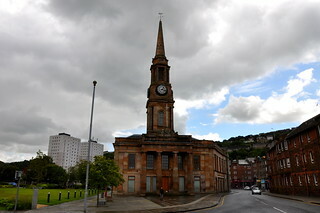 Just around the corner from Bay St is the centre of town – the Port Glasgow Municipal building. Below is a photo from the 1902 King Edward’s VII coronation celebration and then as it is today. Pretty similar really. When Isabella and Williamina were in their 20s, they lived in Renfrew, a town about half an hour from Port Glasgow. Isabella stayed there for over 30 years. 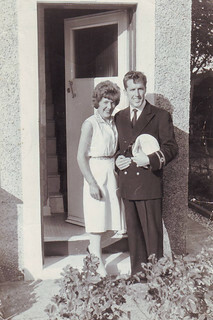 She sent a photo of herself and her son to my grandmother outside their Renfrew house. I figured I should go and see the place, and ended up bothering the nice guy living there about whether he knew my great aunt. He asked around the other neighbours and a woman who had lived there for over 50 years remembered Mrs Craig and her 2 sons. She apparently worked on the buses. 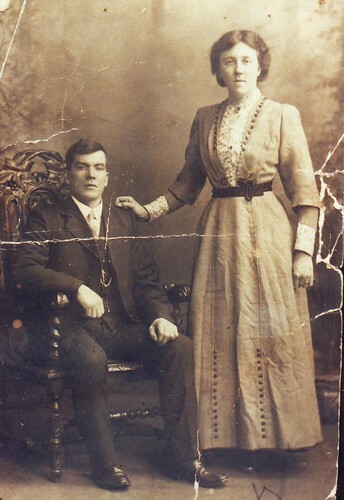 Williamina lived just around the corner at 15 Fitzalan Rd until she was 24 and married my grandfather, Michael Harte. I visited that house as well, but didn’t knock since 1941 was too long ago to expect someone to remember. 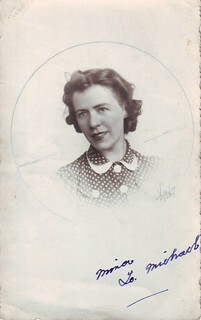 Williamina was working as a bus conductor like her sister and met my grandfather on the buses. While Williamina was living at this house and she was courting my grandfather, she sent the photo on the left to him in Manchester in June 1941. They were married by November in the picture on the right. 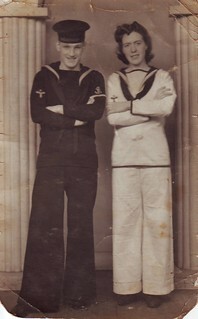 He was working as a stoker for the Navy during WWII which is why they’re wearing the matching uniforms in the photo. So sweet! Port Glasgow used to be a major shipbuilding port on the River Clyde, and everyone who lived there was connected to the shipbuilding industry in some way. The Queen Mary and the Queen Elizabeth 2 were famously built on the River Clyde and the shipbuilding industry was crucial during WWI and WWII. Williamina’s father, James Lynch, worked in the shipbuilding industry as a Rivetter Holderon, which means he worked in a team that joined metal plates with hammered rivets. Williamina’s mother, Margaret, worked as a millworker, though I don’t know what kind. The photo below is the only one I have of both of them together. According to my grandmother’s notes on the back of the picture “[Margaret] had the greatest sense of humour – unfortunately was always in poor health and died at 40 years. She had beautiful auburn hair, brown eyes and pink and white complexion. The dress was green.” A treasured memory of her mother. 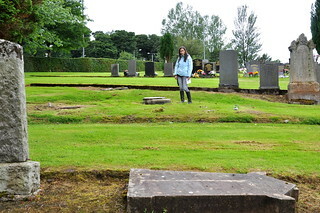 We tried to find James and Margaret’s gravestones in Port Glasgow cemetery. 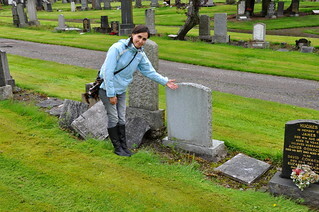 We got the plot locations in the cemetery but unfortunately the gravestones were no longer there. It’s surprising that it took less than 100 years of human or natural interference for the gravestones to be broken and lost. On the left, James Lynch’s section of the cemetery had more broken stones than whole ones. In Margaret’s section, most of the stones were whole but her’s was one of a few missing ones. We were so disappointed that the gravestones weren’t there any more. I was also gutted I couldn’t find Isabella’s sons to get in touch either. 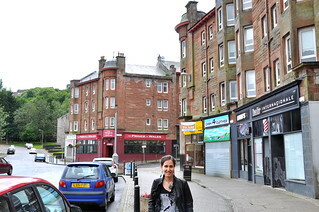 But it was wonderful to see Port Glasgow. 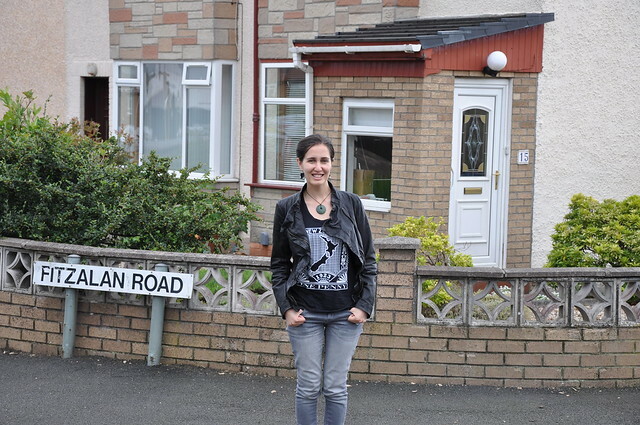 I loved seeing the streets and learning all I did about this part of my family too. An unforgettable experience. There’s still a bit more of Scotland trip to come, so stay tuned. Thanks so much for getting in touch. My grandmother lived on Fitzalan St from 1938 to 1941. She was known to her friends as Mina, rather than her full name Williamina, and her sister Isa lived around the corner. If it’s not a bother, it would be wonderful if you could ask your neighbours at number 3 if they do remember her. She used to work on the buses as a conductor when she was at Fitzalan. P.S. I’ve blanked your friends’ names and your surname, just for privacy reasons. No biggie, I’m sure.